Gorgeous blooms with wide rounded petals and ruffled edges. But its real claim to fame is its unique shade of color, a luscious blend of melon and pink. Pictures don’t do it justice. 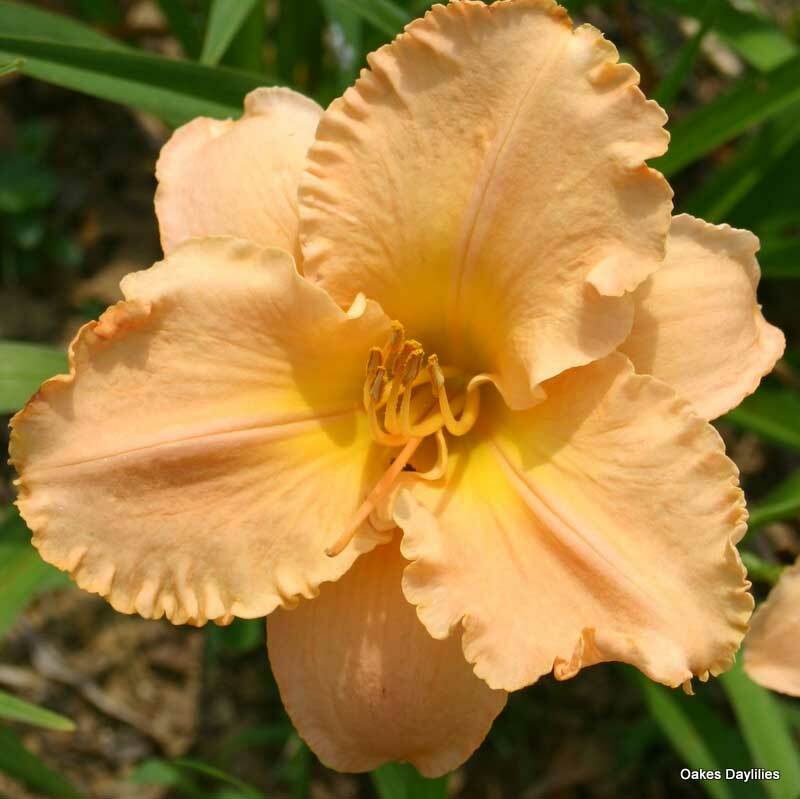 Winner of the Stout Medal – daylily’s highest award. I have been holding my breath for 4 seasons waiting for this beauty to bloom. I almost called Oakes for a replacement. Finally she did, this mid July 2016. I really thought she was a goner and would never do anything. 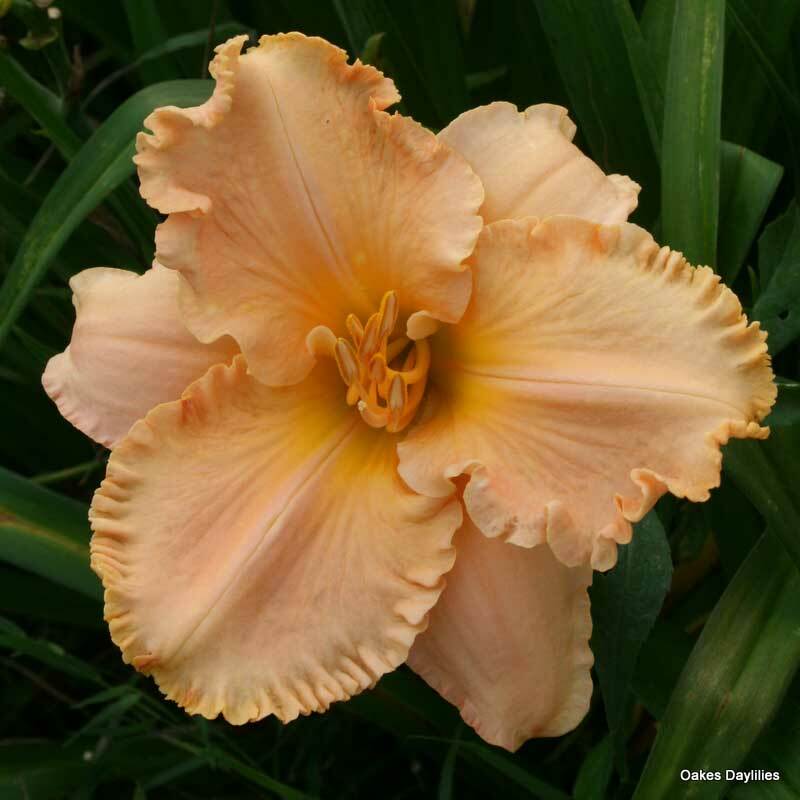 And now she has, and is beautiful, a light peachy with ruffles and blending well other peachy varieties. I have no idea why it took her so long to take off. The winter before last was brutally cold: last winter was mild. Maybe she is susceptible to winter temps. I don’t know. I think i will mulch her well this year, as she is so pretty and I don’t want to lose her after all this time. These were sent as a bonus plant with my order last year. In our zone 9 the first bud opened May 16th. The impressive 6″ flower is at the same time simple and flamboyant. Foliage is fresh dark green with a wider blade than average that arches nicely. Like the foliage, the flowers are of heavy substance, wide, and open clean. The color is tricky: it sometimes reminds me of orange sherbet ice cream and sometimes of cantaloupe, but there’s a hint of pink that shows up when it’s photographed! All in all it’s a lovely daylily and is striking here in front of a red Japanese maple with blue cranesbill underplanting. 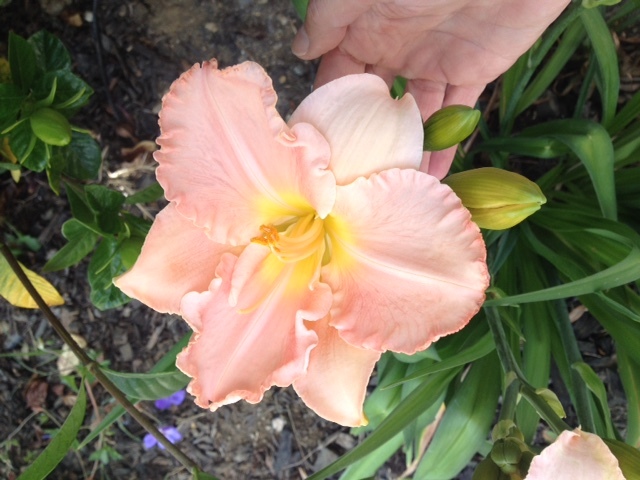 Consistently my best producing daylily. 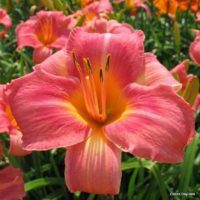 If you fertilize several times a year, the color is outstanding, and it repeats. Once a year I use Bayer 3 in 1 (for roses), and I have no disease, or insect issues and the plants love it. 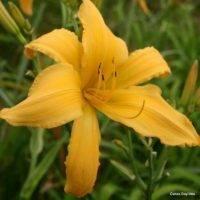 I planted one of these in my Houston garden last fall, and it is already blooming (mid-February) with six sturdy scapes, each with 8-9 buds. Granted, we’ve had a mild winter, but still! The flowers are large and just like the beautiful peachy apricot color in the picture. The plants are nicely upright and a healthy green and will be a great backdrop for other flowers, too. My Elizabeth Salter is blooming right now. The blooms are paler on mine than the flower in the picture. Mine is also taller than stated – more like 26 inches. It really is full of buds, on branched scapes, so I’m happy with that, for sure! If I liked the color more, I would have rated this one a 10. This is a beautiful flower, that’s it though. It’s a very short plant, hardly any flowers and no growth to speak of, and this after 3 years!! I have heard that Salters do not do well in zone 5/6, so beware all those from our zone. really like the blooms, but it takes longer than others to establish and then has very few blooms. Still waiting to be blown away. I love this plant!! So many flowers and what a beautiful color! We have it growing in Ogunquit Maine next to the road, and everyone who walks by admires it. Very impressed. Heavy and late bloomer. Plants delivered were large. Unique and a great eye catcher! 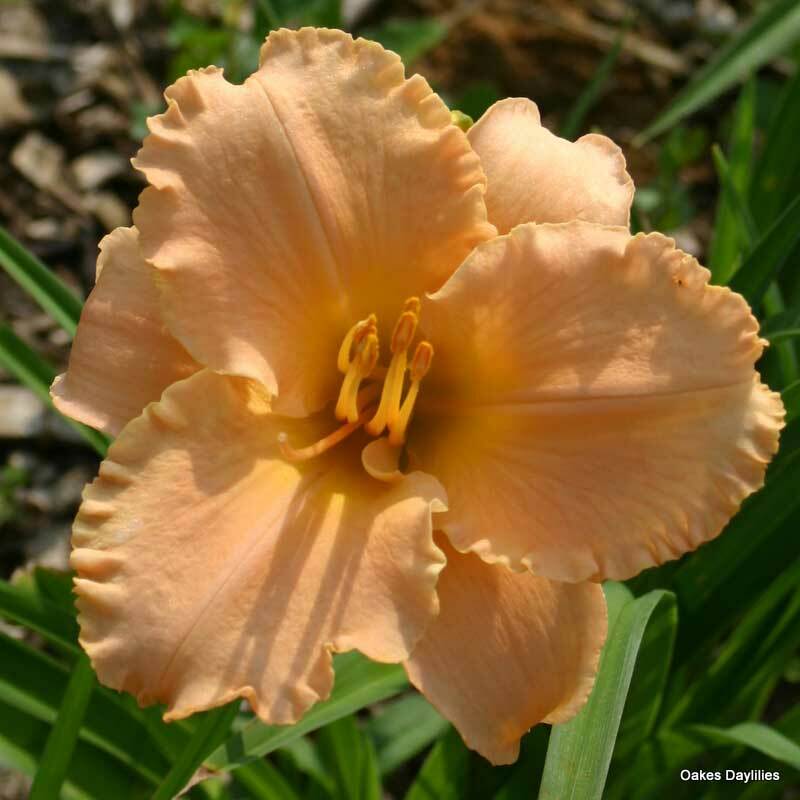 This one is a must have!It’s just an outstanding daylily the color is yummy. 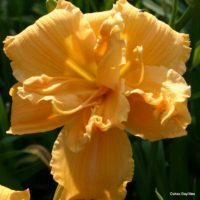 Wow the blossoms on this flower are huge and with its ruffles and unusual color makes it better than a 10. I have had this beauty in my garden for years. 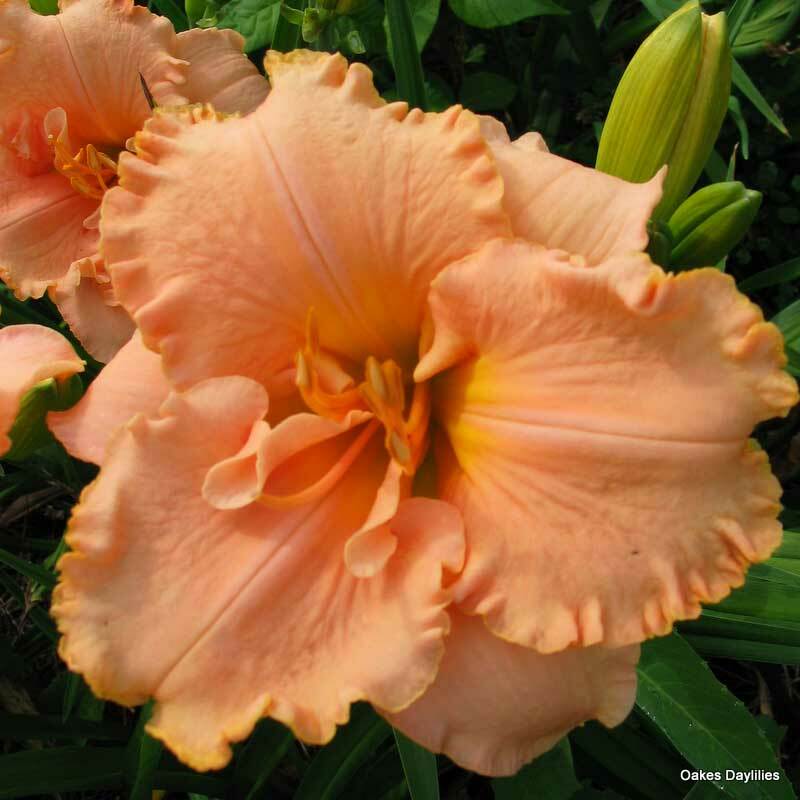 A very reliable bloomer and very pretty next to lemon yellow daylilies.